The AJ Bell London Triathlon celebrated its 20th birthday this year with over 10,000 participants and 30,000 spectators attending, making it the world's largest triathlon. Participants from the 52 different countries included celebrities such as Spice Girl Mel C and the Gadget Show's Jason Bradbury. The rest of the field was made up of Olympians, Commonwealth medallists and first-time triathletes. Mel C, has become a well-known face on the triathlon circuit, having recently competed in the AJ Bell London Triathlon sister event, the Bloodwise Blenheim Palace Triathlon. Mel commented: "I love London, this is my third time in its 20 years. I've just had my best race here and I look forward to next year". Additionally, Jason Bradbury, presenter of the Gadget Show returned to the AJ Bell London Triathlon for his second year running and took on the bike leg of the sprint distance in a team relay distance. He said "I'm delighted to be part of a team of Parliamentarians that took part in the AJ Bell London Triathlon to raise money for the British Triathlon Foundation Trust. It's always great to take part in the triathlon especially raising money for such a worthwhile cause". Jason raced amongst a team of nine members of parliament including Andrew Griffiths, MP for Burton, who received the baton to Jason after a fantastic effort on the bike. The Parliamentarians took part in the race in aid of the British Triathlon Foundation Trust. Andrew Griffiths commented; "The AJ Bell London Triathlon has inspired a group of flabby MPs to get fit and train for this event. It's been intensely fun and most importantly it's raising thousands of pounds for local charities." Thousands of additional fundraisers also took part in the event, seeing more than £1 million raised for charity. With the event taking place over two days the competition reached its climax on Sunday as David Bishop and Charlotte McShane stormed to victory in the men's elite and women's elite races recording times of 1 hour, 45 minutes and 13 second and 1 hour, 56 minutes and 33 seconds respectively. Charlotte McShane timed 18 mins 35 secs on the swim, 58 mins 21 secs on the bike and 35 mins 59 secs on the run to secure her victory. David Bishop narrowly beat Dan Wilson and Matthew Roberts to finish 1st finished his swim in 17 mins 45 secs, his bike in 52 mins 9 seconds and his run in 32 minutes flat. The AJ Bell London Triathlon has grown from strength to strength through its 20-year history. When the event debuted in 1997, there was only Olympic distance on offer. Fast forward 20 years and participants can pick one of four; super-sprint, sprint, Olympic distance and, a race type unique to the AJ Bell London Triathlon, Olympic plus. There are also two team relay options, meaning there really is something on offer for everyone, from elite triathletes to first timers. AJ Bell are the presenting partner and are one of the UK's largest providers of online investment platforms and stockbroker services. AJ Bell currently help more than 131,000 customers to invest smart and achieve their financial goals. 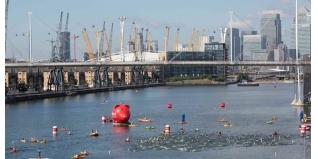 Andy Knee, Managing Director of event organisers IMG MPS, commented: "This is the 20th year of the AJ Bell London Triathlon and it's great to still see so many competitors and spectators take to the streets of London to enjoy this spectacular event. We are very proud to have watched the event grow into the largest triathlon in the world, and firmly believe the iconic central London course continues to bring people back year after year".